Reminiscent of the sunset reflecting off a field blanketed in snow, this dramatic bouquet is certain to be remembered. 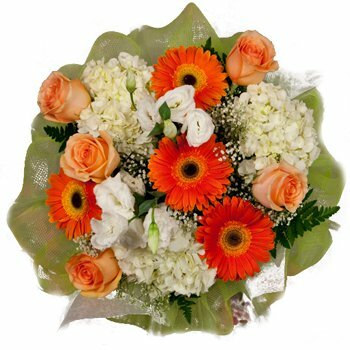 Dazzling Gerbera daisies in bright orange and perfectly peach roses are juxtaposed with clouds of creamy hydrangeas and miniature roses in brilliant white and surrounded by a puff of iridescent green ribbon. The Sun and Snow Bouquet makes a gorgeous addition to a fall wedding, an elegant Housewarming gift, or a brilliant offering for co-workers from administration.